The Pyranometer Sensor is calibrated to measure the shortwave radiation reaching the Earth's surface, measured in Joules m-2 s-1 or Watts m-2. Apogee's unique self-cleaning dome-shaped head prevents water accumulation. The sensor head is potted solid to prevent internal condensation in humid environments. In addition to the standard SP-110 pyranometer, there are also 2 models available with amplified outputs up to 2.5 or 5V. Cable: 3 m of shielded, twisted-pair wire with Santoprene casing, ending in pigtail leads. Additional cable available. 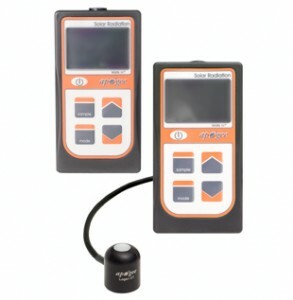 For portable monitoring, Apogee now have two meters for measuring solar irradiance. MP-100 includes and integral sensor, while MP-200 has a seperate sensor on cable.